• Power Up in 3 Ways: Free USB cable (included) and mains adapter/charger(not included). • Bright LEDs and 9 Brightness(3 modes and each mode has 3 brightness levels) Settings allows you to set the desired light level. [UPGRADED ] 3000K WARM SMD LED AND 6000K WHITE SMD LED TECHNOLOGY. Most suitable light color for eye-care reading. LED evenly light up 3x times lighting area than normal LED. Long press to change color temperature ; quick click to adjust the brightness.3 modes and each mode has 3 brightness levels. THE BEST portable book light for bookworms and kids. LOVE TO READ AT NIGHT WITHOUT DISTURBING YOUR PARTNER. This new book light is 2.15 oz super lightweight. Perfectly weightless for clipping on your book, creating a private reading space for you alone when your partner is sleeping next to you. Ideal for nighttime reading in bed and for travel. EYE-CARE SOFT DIFFUSED LIGHT, easily light up 2 full pages of any size book. No need to adjust the light from time to time. 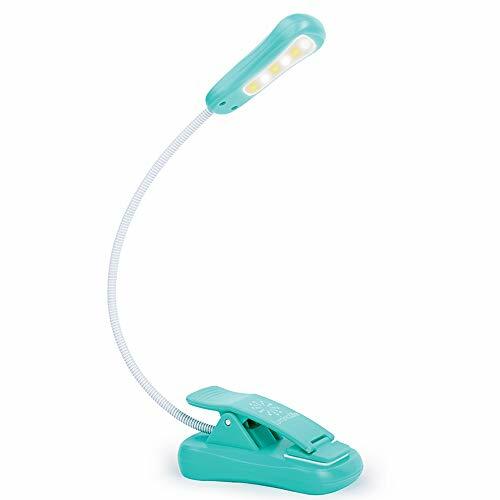 This night reading lamp comes with a SECURE PADDED CLAMP AND INFINITELY FLEXIBLE NECK allowing you to position and focus light exactly where you want it. Also perfect for camping, kid's reading, study, music stand, computer light, tasks and hobbies.